Diabetic retinopathy is more frequently diagnosed among people with diabetes. The complication is associated with damaged blood vessels in the retina. Diabetic retinopathy may initially cause only minor vision problems, but if you don’t take any action you can end up blind. However, the good news is that if diagnosed early, specialists can reverse the disorder. So if you have diabetes you would be well advised to have a baseline eye exam. Anyone with Type-1 or Type-2 diabetes is liable to present with the condition. 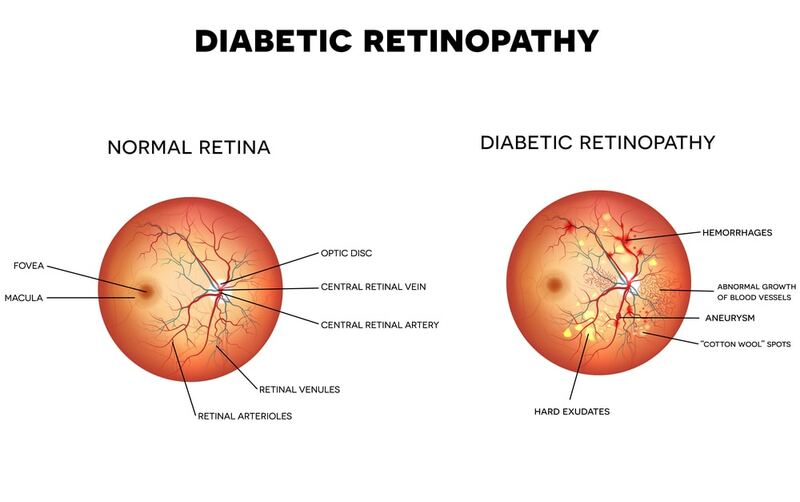 The risk of your having diabetic retinopathy increases the longer you have had diabetes. As with some other eye diseases, risk factors are high blood pressure and cholesterol levels, smoking or pregnancy. There is also an ethnic dimension in that being black, Hispanic or Native American suggests higher risk levels. Diabetes causes elevated sugar levels, and this can damage the small blood vessels feeding the retina. A related condition, diabetic macular edema (swelling of the retina), occurs when damaged blood vessels leak fluid into the retina. This can cause a swelling in the center of the eye. Ocular problems are often connected to retina disorders. Diabetic retinopathy and macular degeneration are just two of the more common retina complications. The New Jersey Eye Center’s retina specialist can discuss your particular circumstances and offer treatment advice. We are able to treat severe perfusion prolific diabetic retinopathy. We also treat diabetic macular edema (swelling) with intraocular injections. Many diabetic patients also benefit from laser procedures. Quite a number of patients present with vision problems not knowing that they face a risk of diabetic retinopathy. Some common symptoms of diabetic retinopathy are blurred vision, the appearance of floaters, difficulty with color perception, and eye pain. Your vision may also fluctuate; you may see dark patches instead of images. These symptoms usually occur in both eyes. The best thing you can do if you have diabetic retinopathy is to actively manage your diabetes. This can slow down any vision loss. Annual eye exams are a must, even if you think you can see perfectly well. Get your doctor to carefully monitor your blood sugar level, and talk to him or her about the frequency of such checks. Ask about a glycosylated hemoglobin, or hemoglobin A1C, test. This indicates your average blood sugar level over the previous 2-3 months. Get into the habit of taking regular exercise, and make sure you take the necessary diabetes medications. If you smoke, quit! Eat healthy foods, and report any vision changes right away. To test for diabetic retinopathy the specialist normally puts drops in the eyes to make them open wide. This is called a dilated eye exam and allows a better view of the retina. 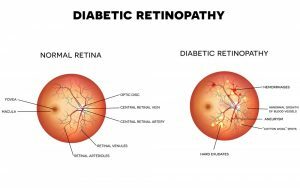 There are two types of diabetic retinopathy. In early diabetic retinopathy, called non-proliferative, new blood vessels fail to form or may become blocked. Sometimes nerve fibers and/or the macula (the central part of the retina) may swell up. The second type, advanced diabetic retinopathy, on the other hand, can be more severe. Doctors call this proliferative diabetic retinopathy, and it can block blood vessels. This, in turn, causes abnormal blood vessels to form in the retina, and these can leak into the center of your eye. In the most severe cases scar tissue forms and this can lead to detachment of the retina. The condition can also lead to glaucoma. Complications of diabetic retinopathy can lead to vitreous hemorrhage, obscuring your vision. A more serious complication is glaucoma. Here new blood vessels prevent the normal flow of fluid out of the eye. This causes pressure in the eye that can build up and damage the optic nerve. Blindness can result. If you have any concerns or questions relating to retina disorders, feel free to contact The New Jersey Eye Center. Our Retina Specialist, Dr. Lauren Kallina, can talk you through things and recommend the most appropriate treatment. She’s an expert on diabetic retinopathy, so you will be in safe hands. Do not hesitate to contact us if you have diabetes. Be aware that If detected early, we can prevent diabetic retinopathy from progression. Short Description: Diabetic retinopathy is more frequently diagnosed among people with diabetes. The complication is associated with damaged blood vessels in the retina. Diabetic retinopathy may initially cause only minor vision problems, but if you don’t take any action you can end up blind. If you have any concerns or questions relating to retina disorders, feel free to contact The New Jersey Eye Center. Our Retina Specialist, Dr. Lauren Kallina, can talk you through things and recommend the most appropriate treatment. She’s an expert on diabetic retinopathy, so you will be in safe hands.